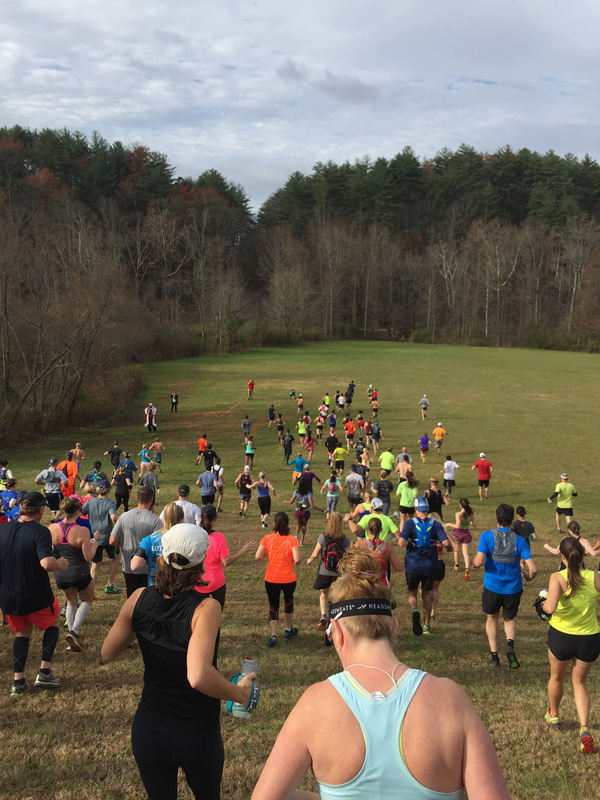 We had a great and fun-filled Thanksgiving weekend and hope you did as well – so much fun, in fact, that we’re going to share it with you in this race report so that maybe you’ll join us next year. 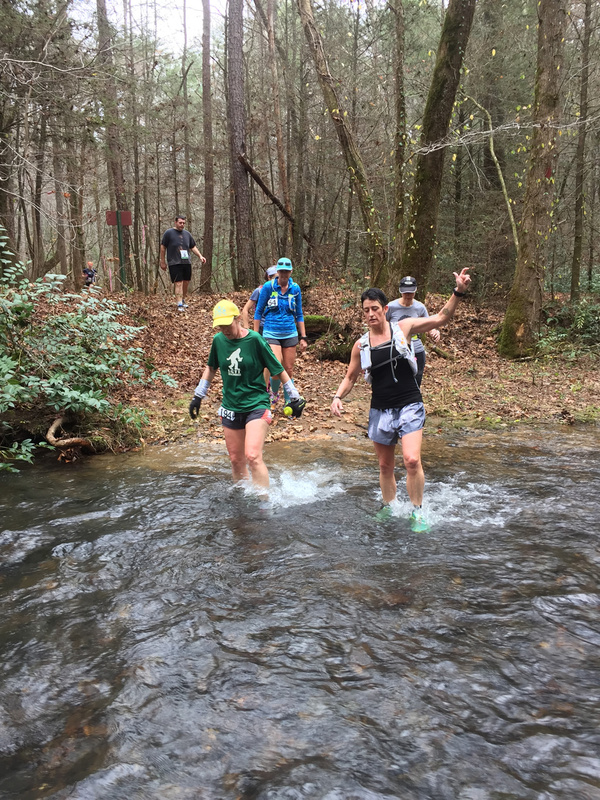 Many readers of our blog and friends know that we’re long-time road runners who’ve begun to make the switch to more trail running events. 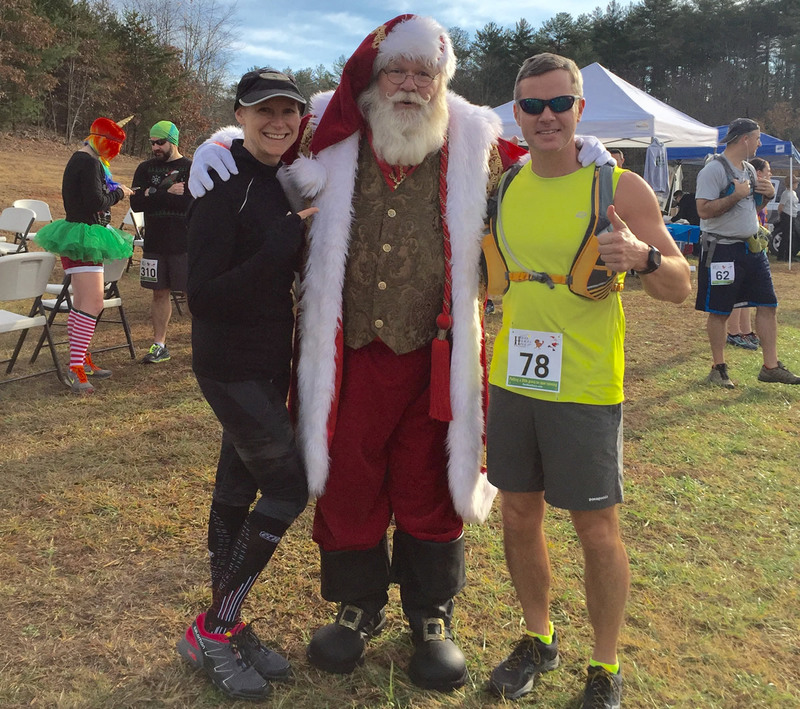 Mary Catherine and I can’t think of a better introduction to trail running than the Helen Holiday Trail Half-Marathon / 10K and Black Friday 5K, always held the weekend after Thanksgiving. Here’s our race report for the 2015 edition of the event held of Friday, Nov. 27 and Saturday, Nov. 28. Like most running families, our Thanksgiving weekend started early on Thanksgiving morning with a race! Our daughter Alex, our niece Maddie, and Joe ran in the PTC3 Turkey Trot 5K (see race report here). After burning some calories, we headed over to Frank’s house (Mary Catherine’s brother and Pastor of Rolling Hills Church) for a Thanksgiving feast. Happy Thanksgiving 2015 from our family to yours! Friday morning, our son Stephen and Joe headed over to World Gym for an early morning weight lifting workout before we all headed over to Chris’s house (Joe’s brother) for Thanksgiving feast number two! I’d say we were all pretty much carbo loaded for the race festivities ahead. 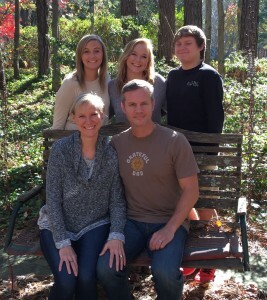 After saying goodbye to everyone, it was a short two hour ride from Conyers to Helen for the race weekend. We had reservations at the Unicoi Lodge, using a discount code provided by the race director. Not only was our room discounted, but it also included a free breakfast buffet for the next morning (which is the norm at most commercial hotels, but not the norm for the Lodge) – nice touch! 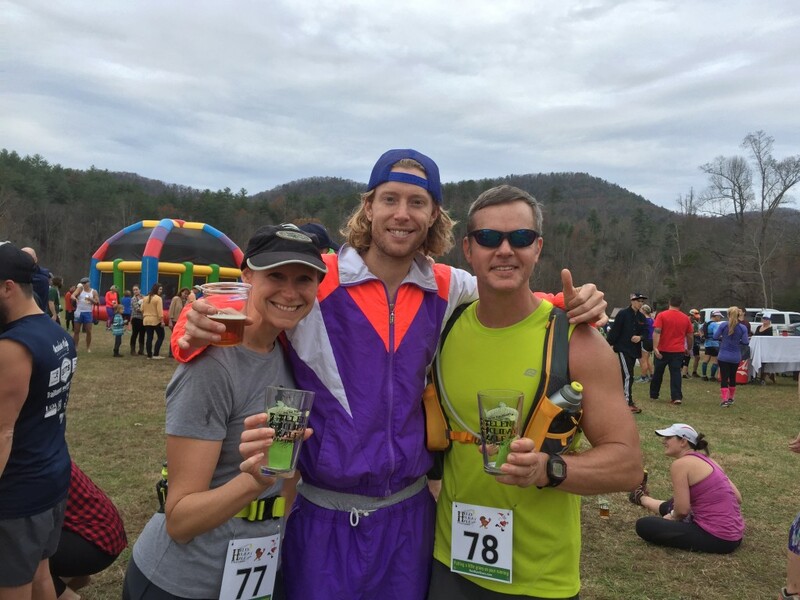 The race weekend was organized by Sean “Run Bum” Blanton and his company Run Bum Tours. 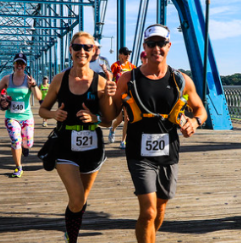 From his website, “Traveling all over the world, running for fun and in races, inspired me to design Run Bum Tours’ races to be scenic, breathtaking, and epic. In doing so, I’ve taken everything I have ever loved about all the races I ran in and incorporated them into ours. Of course, I got rid of everything else that I hated about certain races too.” Although that sounds kind of lofty for a race, we feel like he’s actually successful at it. 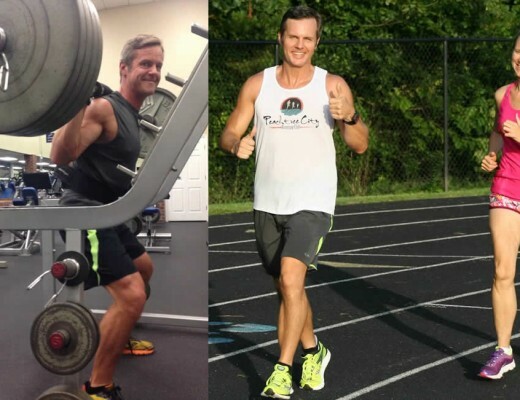 We got a chance to talk with the “Run Bum” and can’t say enough good things about Sean. 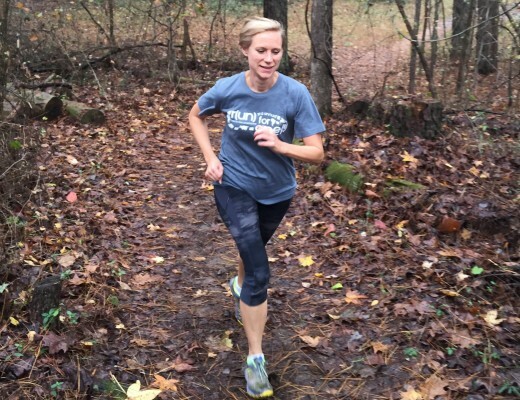 Not only is he a fast runner himself (you wouldn’t know because he doesn’t brag), but he’s also an up and coming race director that’s figured out how to inject fun back into running events. The weekend was a huge success due in large part to his ability to attract a fun staff, thoughtfully take care of all the event details, plan out fun and challenging courses, and then there’s that “Be Epic” personality. Honestly, it’s hard to articulate – you just gotta be there and experience it. As mentioned previously, the race start/finish area was in the big activity field directly behind Unicoi Lodge. We checked in with no problems and waited for the sun to set. There were about 200 runners of all shapes, sizes, and fitness levels – including families with children. Some wore costumes. We just wore our running clothes with illumination – Joe had a clip-on headlamp for his hat and Mary Catherine carried a small handheld LED flashlight. Just before the start, we had a chance to talk a little bit with the “Run Bum” Sean. 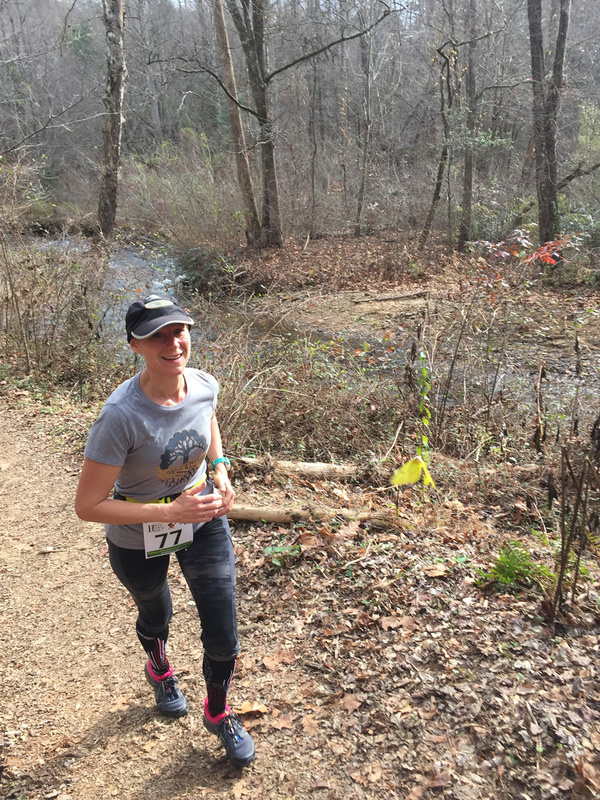 He designed this race and the Saturday Half-marathon / 10K as fun events, geared especially towards new trail runners – like us. 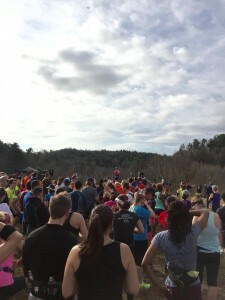 The 5K was non-competitive and the Saturday race was only going to give awards for the top three overall male and female. The Run Bum has charisma and we were both excited for the weekend. In fact, Sean ran the event with everyone Friday night. 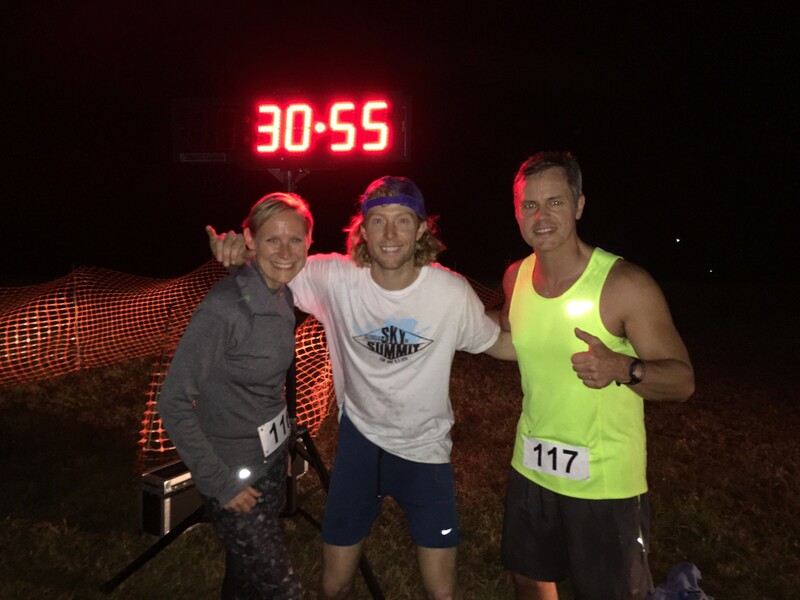 As the time drew near, Sean grabbed the mic and told us all a little bit about Run Bum Tours, the series of races, and what we could expect for the weekend. We were advised to make note of the course markers – pink tape with black stripes as well as signs. He basically said it was impossible to get lost on this big loop – which would include an above-the-ankle water crossing! The race started on Unicoi Bottoms Road, adjacent to the activity field. We followed that around the corner, then hopped on the Helen Trail. The trail was well marked and maintained – no big rocks or log jumps – just a few roots in places. I had never raced in the dark, but it really wasn’t a problem. 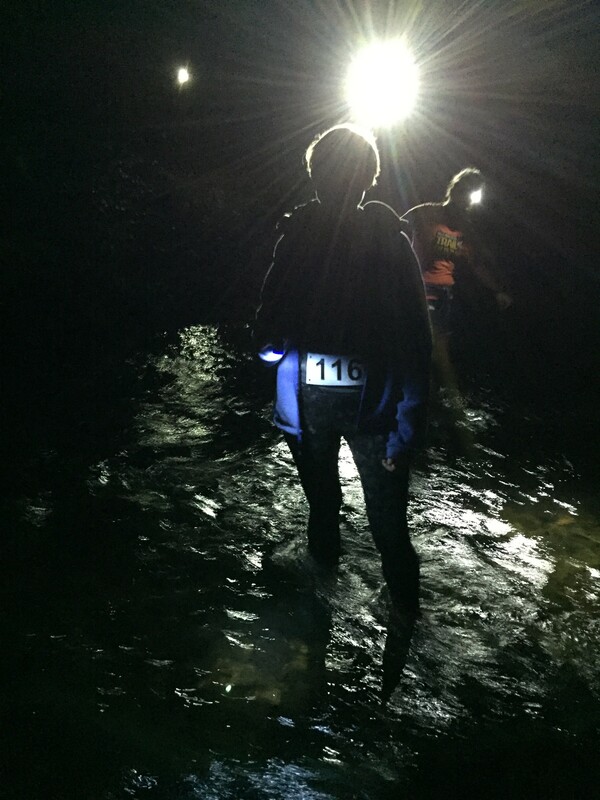 Although it was totally dark, there was plenty of illumination from other head lamps. In fact, there were times I just turned mine off. We were with other runners almost the whole way. 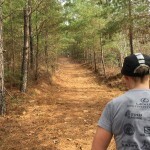 At the trail split, we moved onto the Bottoms Loop trail and followed that around gentle hills down in the valley. Just after the first mile, we briefly hopped back on the Helen Trail before heading west on the mountain bike trail. Even that trail was in great shape. 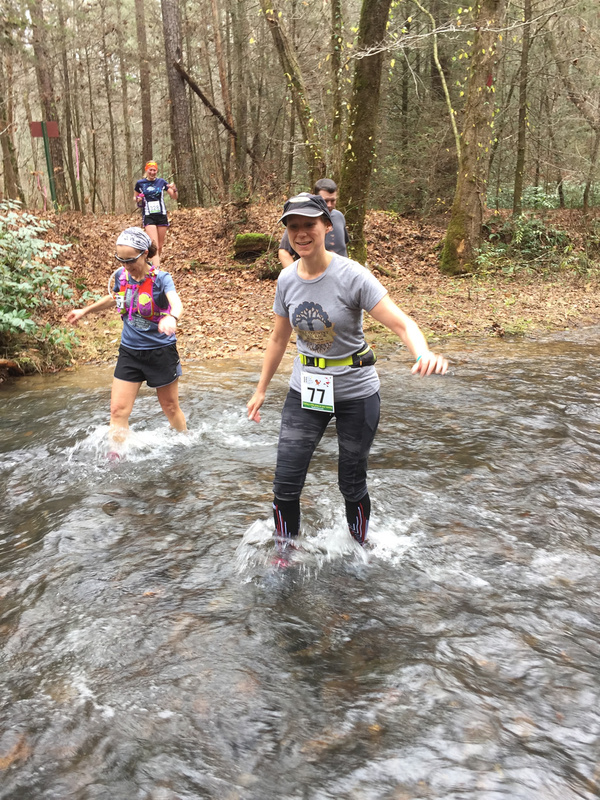 About half-way through the course, the funnest part of the race was dead ahead – the water crossing through Smith Creek! 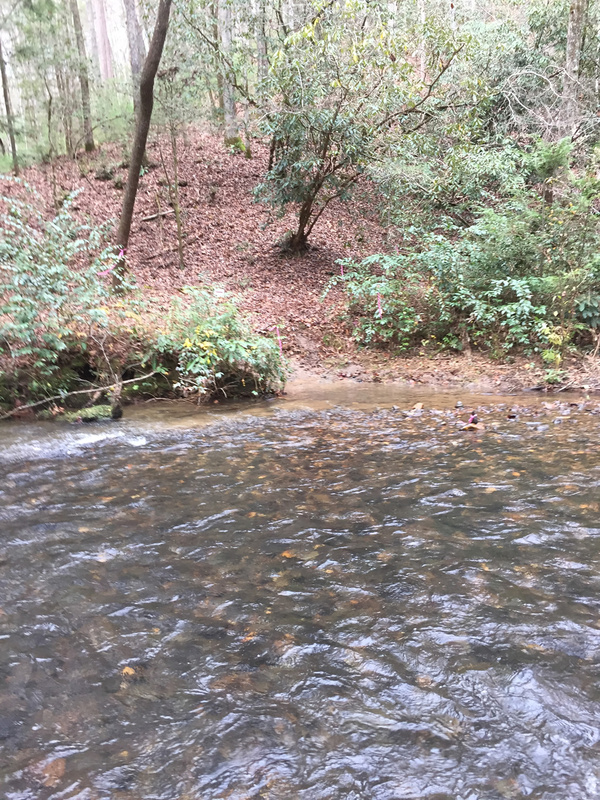 Smith Creek flows from Anna Ruby Falls to the north, feeds the Unicoi Lake, and then works it’s way to the Chattahoochee River just north of Helen. Due to the recent rain fall, the creek was pretty deep and swift moving. We had no problems navigating the water crossing, then started an ascent as we worked our way back up to the activity field. This is what it looks like running at night by flashlight. Lots of fun! 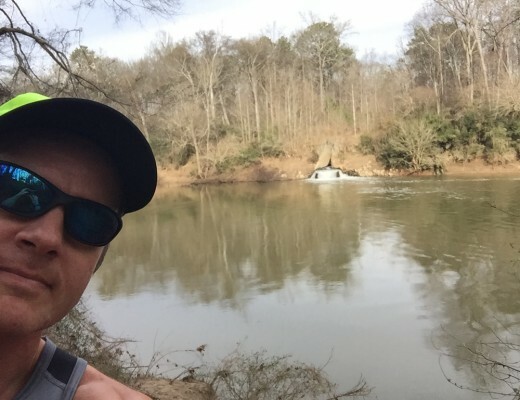 Sean had told us the course was a little short – Garmin logged 2.3 miles and RunKeeper logged it as 2.5 miles. Hey it’s a trail, who cares? 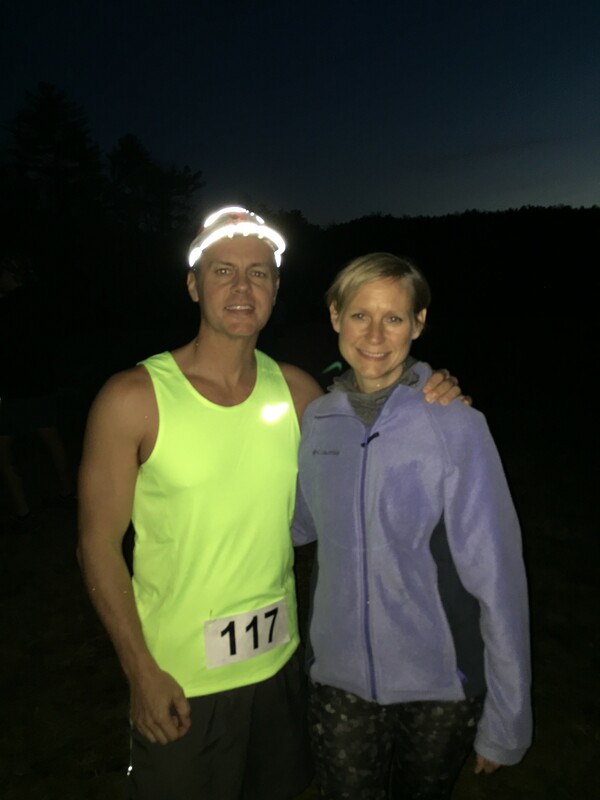 Our first night time race was a total success! We absolutely loved it and were stoked for the next day’s event. Since it was a nice night and the kids were bogged down in Friday night traffic in Helen, we simply walked up the trail back to the Lodge. Once at the hotel, we made a frantic search for old newspapers to help dry out our shoes. You do know that trick don’t you? The best way to dry out running shoes is simply stuff them with newspaper. They’ll dry overnight! 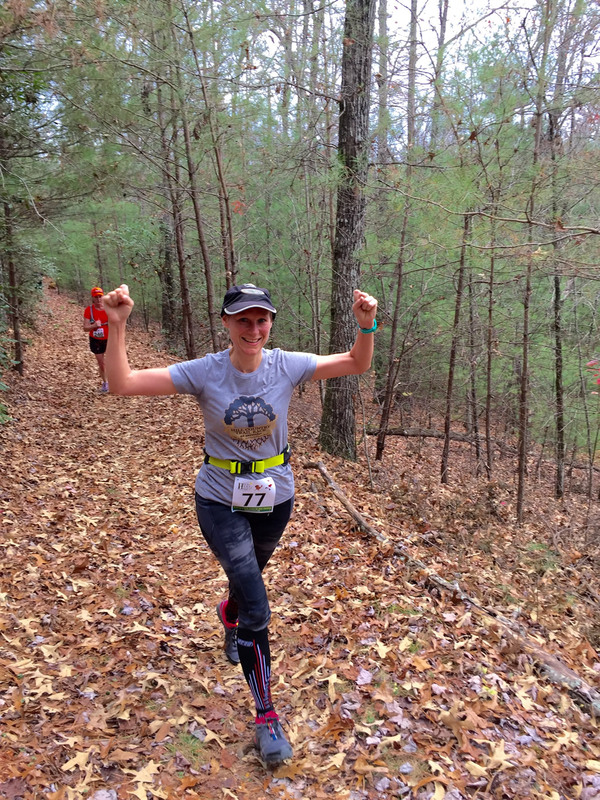 The main event of the weekend was the Helen Holiday Trail Half-marathon. Although a 10K option was available, we wanted to maximize our fun with the longer distance event. Since the race didn’t start until 10a.m and we were literally a 10 minute walk from the start, it was nice to have a leisurely start to the race morning. Most of you who race regularly know how frantic things get with driving, parking, checking in, finding restrooms, etc. None of those were problems at this event. In fact, we had time to have a full breakfast ahead of the race. We took our time getting ready and walked down around 9:30am. Once we got to the activity field for the race start, we noticed right away that this was a much bigger event than the previous night – about 500 people to be more specific. There was a costume contest as part of the event, but we opted not to run in costume. It always impresses me when people run in costume, often times faster than we’re running. Honestly the pre-race scene felt more like a big party than it did a race – a fun party at that with music, laughter, and costumes. As a road runner, I’m used to getting psyched up and warmed up for competition. That wasn’t the case here as we were just enjoying the vibe. In fact, we got our picture taken with Santa Claus himself! Runners enjoying the big downhill start at the Helen Holiday Half! After a quick briefing about the event and the post-run activities, the event promptly started at 10:00a.m. The energy of the race reached fever pitch that seemed to naturally match the massive down hill start. 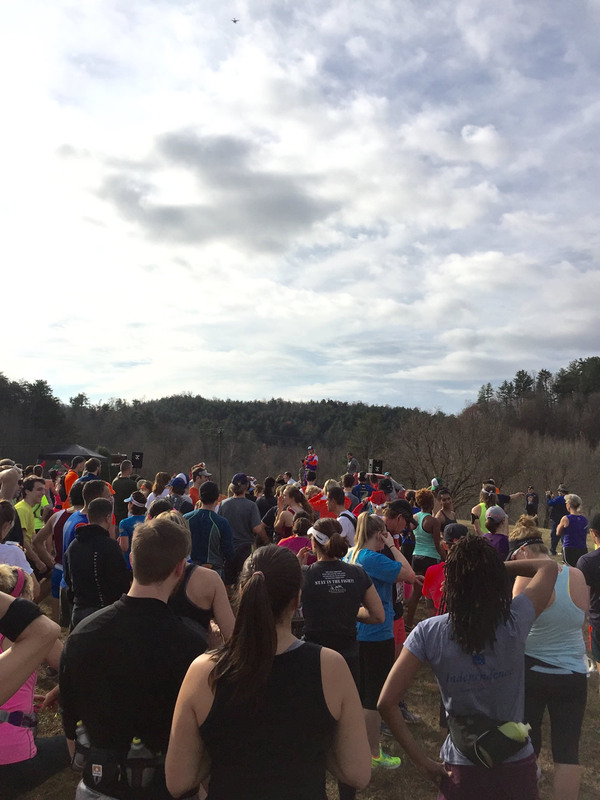 The entire valley was filled with music and energy – what a great way to start a race. 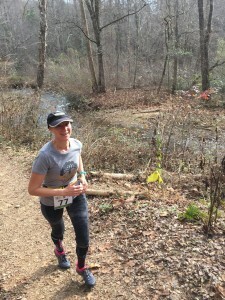 Although the course was mostly a trail run, the first few miles were on the roads in order to thin the crowd a little bit to make those trails more enjoyable. The half-marathon and 10K runners started together and ran the first five miles together. At the bottom of the hill, we were funneled across a small bridge, then back onto Unicoi Bottoms road to begin a loop back up the hill. 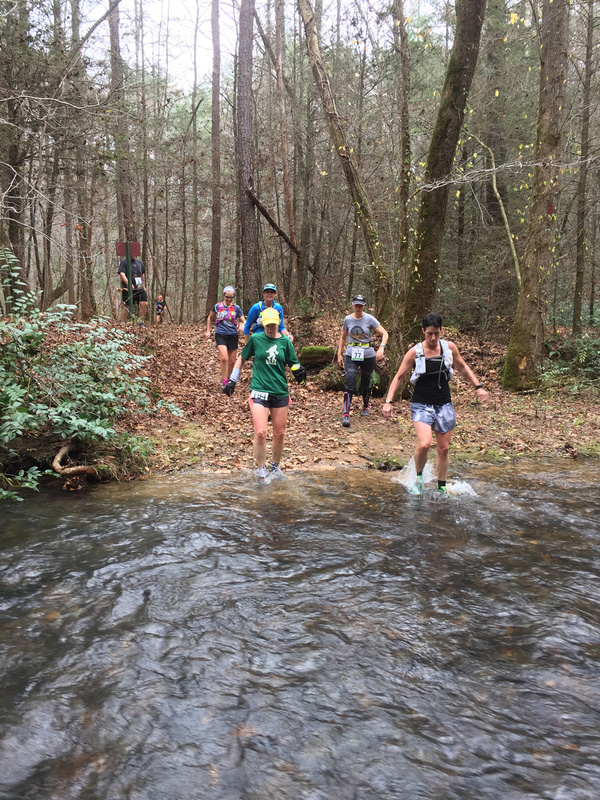 Crowds of volunteers, families, and even curious spectators lined the sides of the road to see a crazy collection of runners beginning their holiday journey around the mountain trails. Once we rounded the corner of the activity field, it was a short road climb up and onto Hwy 356 where we passed mile one before veering north to start a loop around Unicoi Lake and onto trails. As a family, we’ve camped at Unicoi many times before so this was a very familiar trail around the lake. Although runners were starting to spread out a little, things were still pretty tight. Just past mile two Mary Catherine decided it was warm enough to shed a layer and so her jacket was stowed in my hydration pack. Thus far, we had run on roads, trails, and next up was a short jaunt across the Unicoi Lake beach! 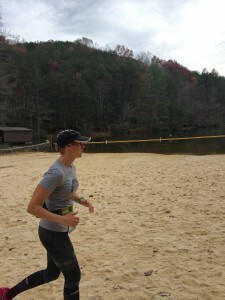 Who runs on a beach in the mountains during winter? We do apparently! By now we were settling in pretty good and really enjoying the race as runners continued to spread out and have a great time. The weather was warm with intermittent sunshine and periods of overcast. 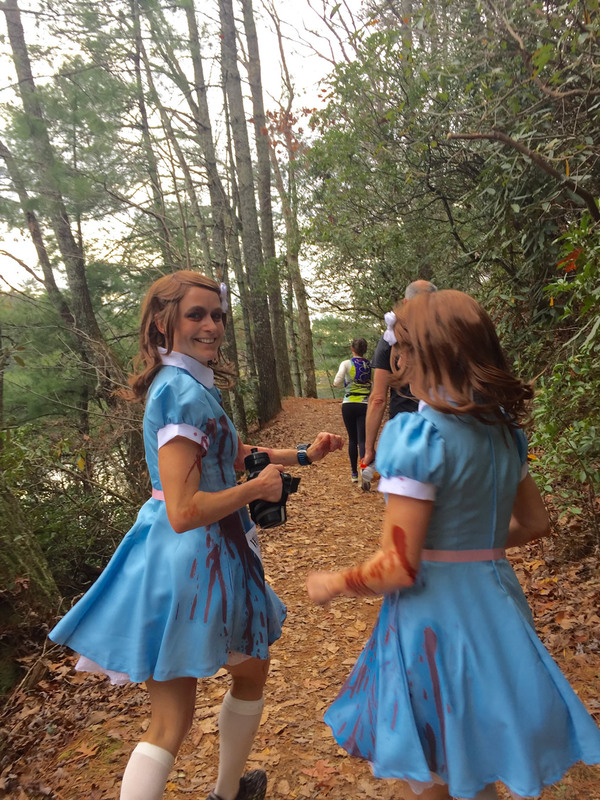 Winners of the Helen Half-marathon costume contest running the trails with us. 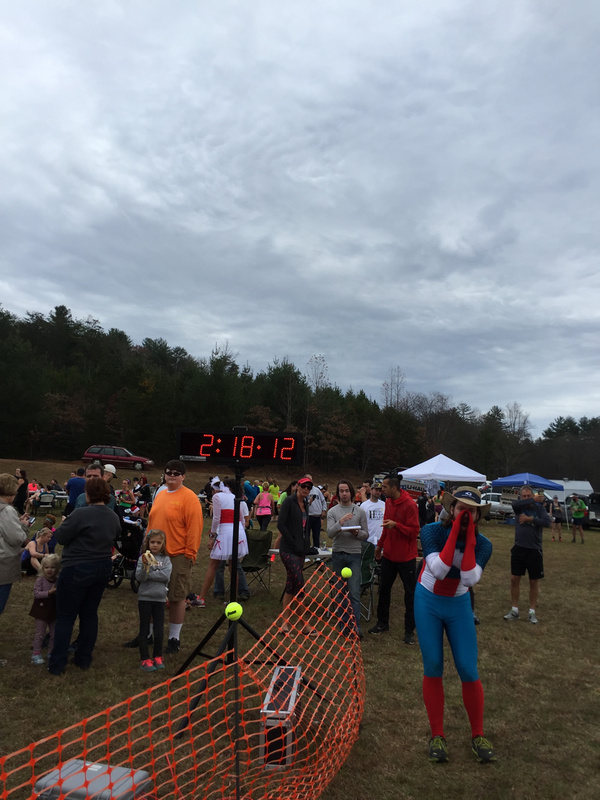 We mentioned earlier that this run included a costume contest. At the start of the race we took a quick vote by applause to determine the winner. There were all kinds of costumes – unicorn, Elvis, Wonder woman, Batman, Elsa (from Frozen), elves, etc. The only rule is that costume contest participants had to RUN in their costumes. The winners of the contest were these girls in the blue dresses (see picture), who passed us just as we were finishing up our lake loop. As I was talking to them taking the picture, I told them how impressive it was to run in costume. 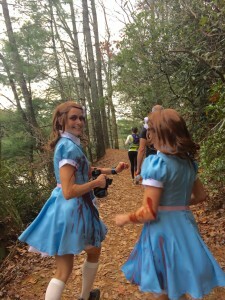 They told me running in a dress is easy, but wearing the wigs was hot and itchy. I didn’t get their names, but job well done girls! 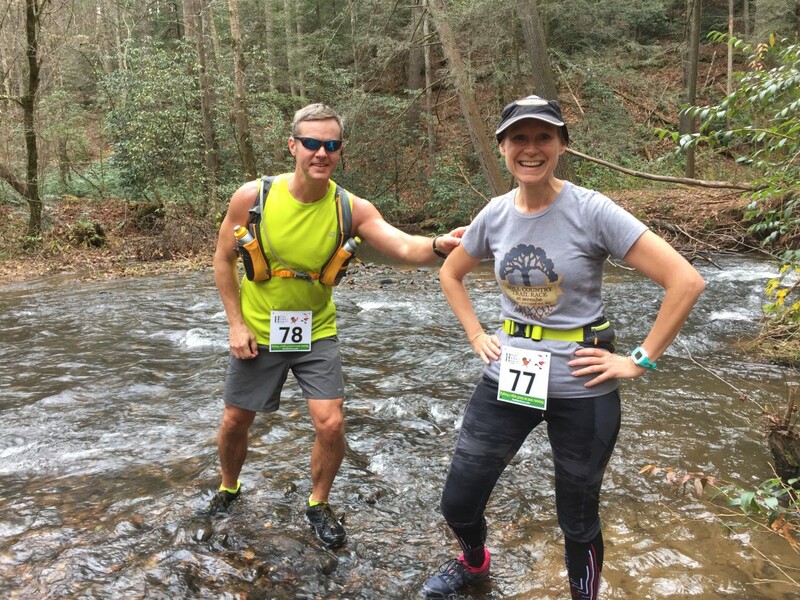 We completed the circumnavigation around Lake Unicoi near mile three and had to hop back on the road (Hwy 356) once again to cross the dam and make our way back to the south side of the park to resume our trail running. There was enough grassy margin on the side of the road that I attempted to make that my trail of sorts. After that road segment, we crossed over to the Lodge side and hopped on the nature trail and back down the hill and onto a familiar trail – the same trail that we had run the night prior. To the left is a map of the entire race course to put things into perspective. You can click on it to get a larger view of it. Be advised that Sean changes race routes often from year-to-year to make the courses better and more fun. 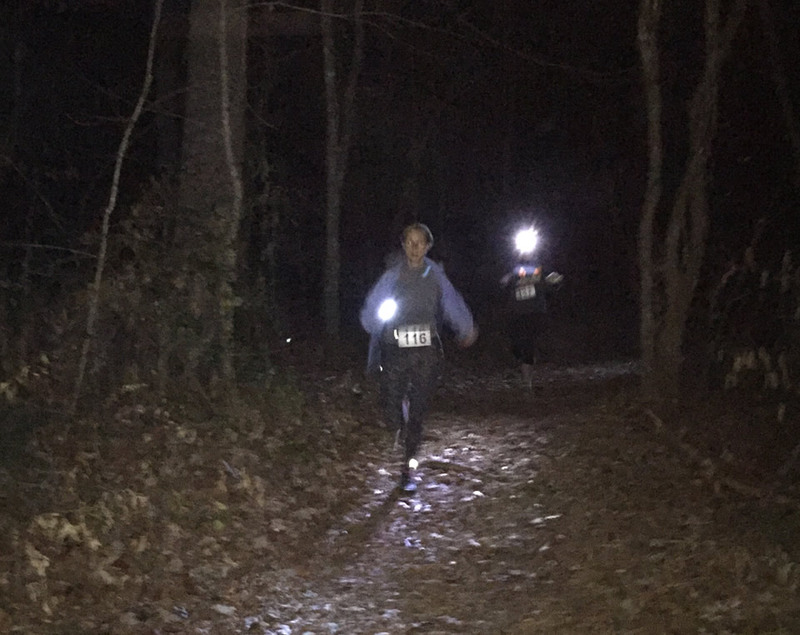 If you’re reading this race report, know later versions of the course will probably be somewhat different than the course we ran. At mile four we were back on the Helen trail and stayed on that and the Bottoms Loop trail until mile five just like the 5K route the night before. Near the five mile mark, the 10K runners peeled off to the right to finish their journey while we continued onward to climb our way to Helen. Most of the hills were in the next few miles of the course. 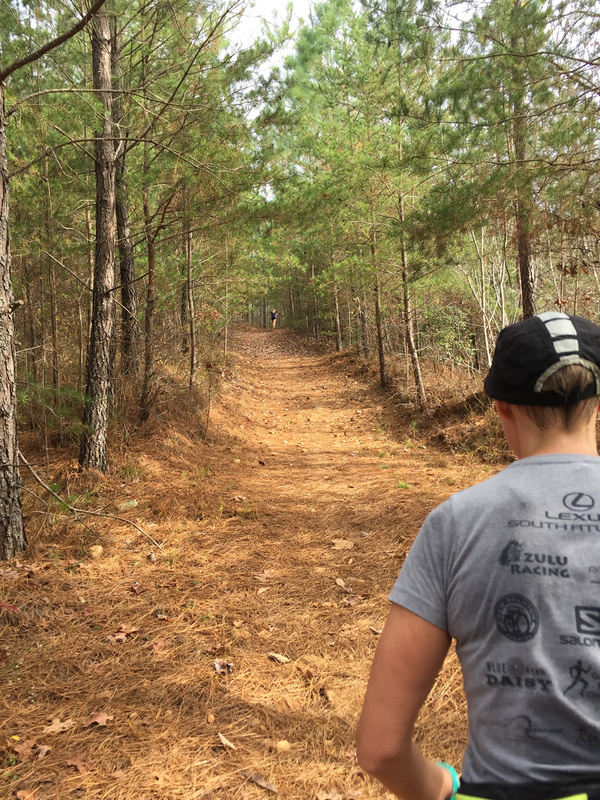 Although we were following a general route towards Helen, our scenic run took us on mountain bike trails and what appeared to be forest service roads – all very nice and not too hard to run. Keep in mind the course was designed for the new trail runner and we both felt the course was exactly that. The climb from the 10K / Half-marathon split was particularly challenging and went almost straight up. The trail itself was in great shape, so that made it feel easier. Had the trail been full of rocks, roots, or debris it would have really slowed things down. There weren’t a whole lot of switchbacks, just long steady climbs up and just past mile six. Below is an overview picture of the course terrain profile. 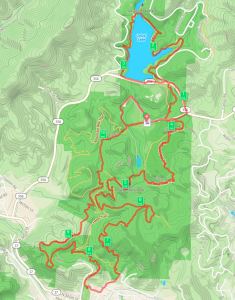 According to my GPS there was just over 1,670 feet of climbing, but keep in mind there were some very generous descents and the course finishes where it starts, so everything evens out. Obviously the 10K runners had it easier, but us Half runners had more fun! Just as in the 5K the night before, the course was extremely well marked with the same pink with black striped tape and it would have been next to impossible to get lost. Volunteers were posted at key intersections to direct the way and check on runners. At no time did we wonder where we were at or have any concern about safety. Cresting the hill just past the 10K mark, we began a long descent into the northeast side of the town of Helen. Sean told us that since the race is getting large enough, next year the city officials are going to allow the race to run through more of the town area for an extra 1.5 miles (tentatively) and we think that’ll make a great addition to the overall course. As we approached Helen, we left the trail for another short road segment near the Helen Fest Halle. Next, we turned north to come up the backside of the Hilltop Park near the town library. 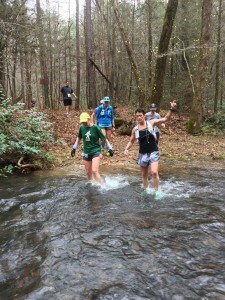 The one and only aid station was nearby on the road just before resuming the trail portion of the course. 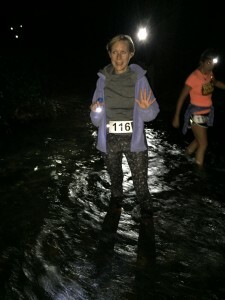 We had been told ahead of time that this was a cup-less race and runners were encouraged to wear their own hydration systems and/or carry water bottles. 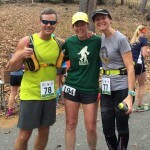 Joe, Lisa, and Mary Catherine at the aid station. 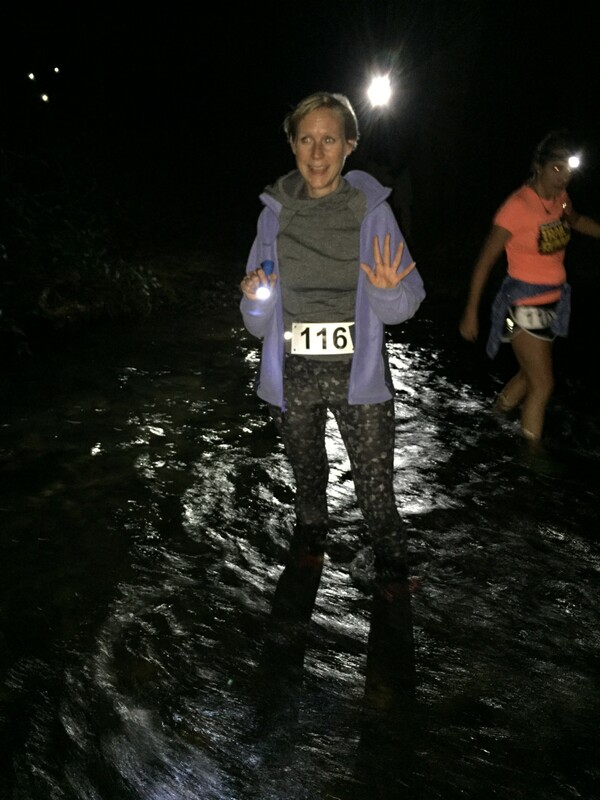 The aid station had water, gatorade, bananas and oranges – everything a runner craves! 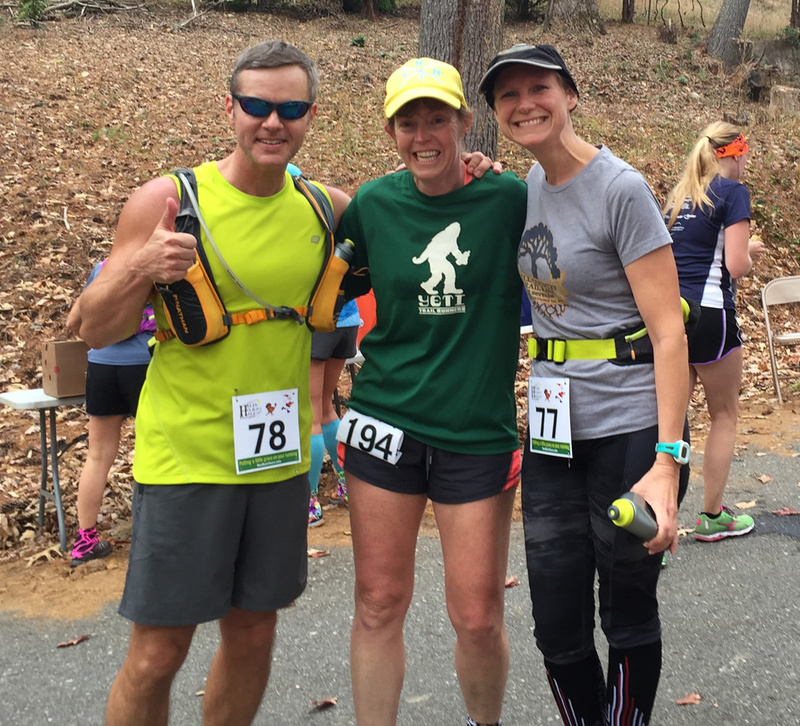 While at the aid station we were happy to run into a friend of ours from back home (and very experienced trail runner) Lisa Mathews. Lisa and her Team Unicorn friends were at the race taking it easy and having a good time. We enjoyed running the next few miles with them all the way to the water crossing. We re-entered the trails on the Helen trail (which connects Helen directly to Unicoi State Park) just behind the park. Just after mile eight we stayed to the left to continue running on the mountain bike trail. 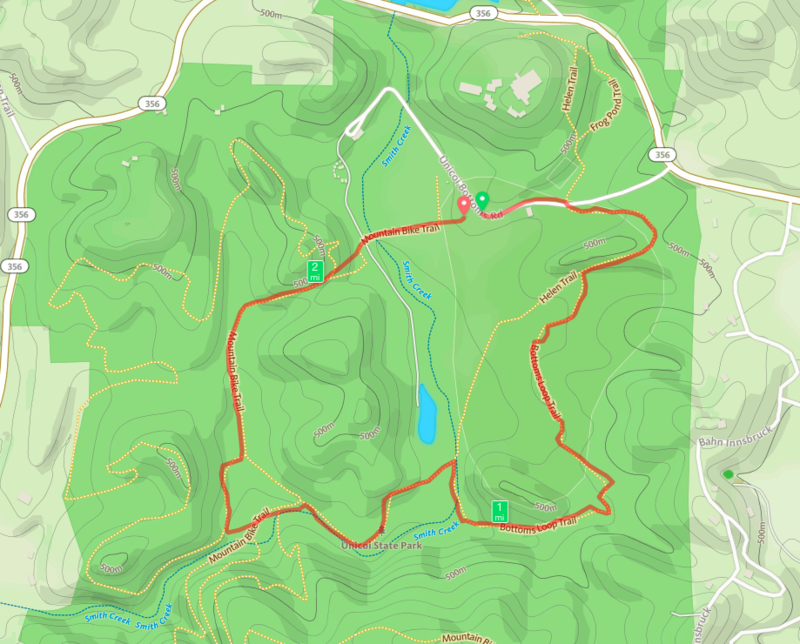 The Helen trail is a more direct route back, but we had more running to do – and that included more climbing! While scenic, the next mile from just before mile eight to nine also included some nice climbs – the second steepest of the day. Once we crested the hill near mile nine, we both felt like the race was drawing to a close too quickly! With great weather, excellent trails, and good friends – we didn’t want the day to end. Before ending, we had one more rendezvous with Smith Creek and we were all looking forward to that. A steep descent took us to the water just before mile ten. Here’s the scene in pictures. Of course someone had to be first in the water to take the pictures (Joe). The image at the very top of this blog post features Mary Catherine coming back to get Joe who’s been standing in the water taking pictures. Helen Holiday Half finish line. Having done this water crossing the night before and knowing the course ahead, we knew our journey was about to end. Sean had told us the course was a little short, but we really didn’t know how short until we got to the water. After crossing the creek, we began a short climb back up to the activity field. The music and loud speakers ahead could be heard well before we could see the finish. It was an uphill finish and both Santa and Captain America were there to welcome us back in. My GPS and RunKeeper clocked us in at 10.5 miles although I truly don’t know what the actual distance really was. 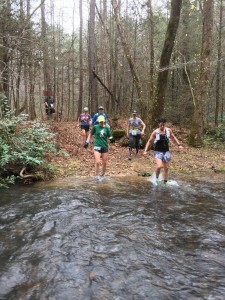 I’ve been warned by my trail running friends that GPS’s aren’t as accurate for measuring distance for trail running due to a variety of factors – especially so in the mountains. While they can pinpoint your location, calculating true ground distance can be challenging. Honestly, we don’t really care how far the course was. 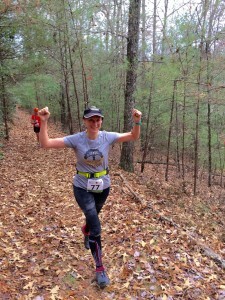 We had a great time – in fact, to quote our race director, we had an “Epic Run”. Yes, it was that fun and we hope to come back again next year with more friends. We felt great after the race and walked back up to the Lodge with the music continuing to fill our ears from the valley down below. We can’t tell you how nice it is to be staying within 10 minutes of the start/finish area – all destination races should be that like. Once back to the room, we changed and were ready to eat! 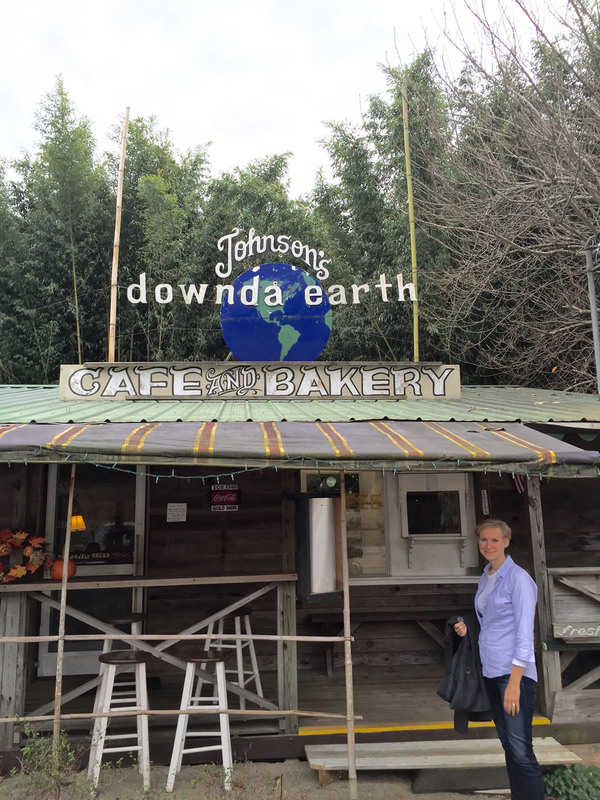 We need to make special mention of the Downda Earth Cafe. We ate there twice over the weekend, it was that good! Owned by husband and wife Lainie and Stan Johnson, it’s located just north of Helen at 7152 Hwy 75-Alternate. They serve farm fresh and vegetarian dishes that are out of this world! Joe is a big meat-eater, but even he enjoyed the veggie “Downda Burger”. Located in a funky old house, it’s really a great spot and we highly recommend it. We ate our post-race lunch there and enjoyed Sunday morning breakfast there the following morning. 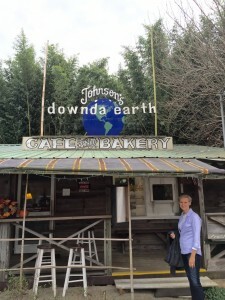 Great food, coffee, and service – a rare treat in the area since many of the establishments in Helen are touristy. If you’re in the Helen area, this is a must stop restaurant. After lunch, we did go back into town with the kids and enjoyed playing tourist a bit – mini-golf, shopping, and roaming around. We ended the day with dinner at Bigg Daddy’s, one of the better in town restaurants and a race sponsor. We like to support race sponsors whenever possible (plus they gave us a discount). The next morning, after breakfast at Downda Earth, we enjoyed a nice family 5-mile hike in the local Smithgall Woods State Park. 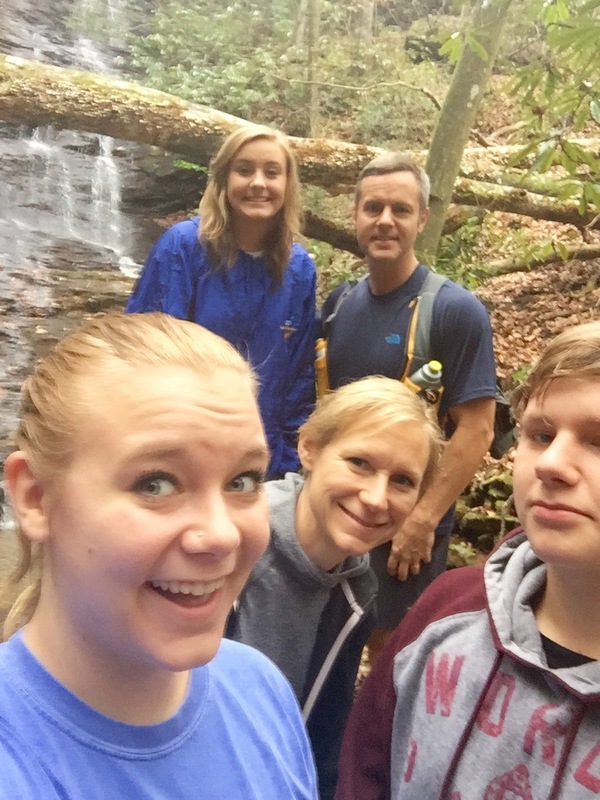 We hiked to the Martin’s Mine (an old gold mine), Hamby Mill, and nearby waterfall to complete our awesome Thanksgiving weekend. Since it’s Thanksgiving, we’re thankful for all of you – our readers!